There has been much written on the new creative economy, but most work focuses on the so-called 'creative class,' with lifestyle preferences that favor trendy new restaurants, mountain biking, and late night clubbing. This 'creative class,' flagship cultural destinations, and other forms of commodity-driven cultural production, now occupy a relatively uncritical place in the revitalization schemes of most cities up and down the urban hierarchy. In contrast, this book focuses on small- to medium-size post-industrial cities in the US, Canada, and Europe that are trying to redress the effects of deindustrialization and economic decline through cultural economic regeneration. 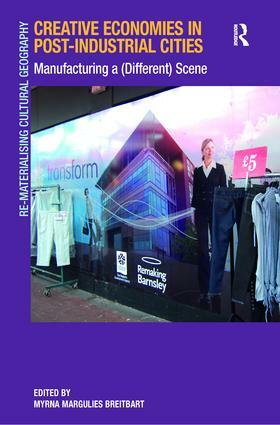 It examines how culture-infused economic opportunities are being incorporated into planning in distinct ways, largely under the radar, in many working class communities and considers to what extent places rooted in an industrial past are able to envisage a different economic future for themselves. It questions whether these visions replicate strategies employed in larger cities or put forth plans that better suit the unique histories and challenges of places that remain outside the global limelight. Exploring the intersection between a cultural and sustainable economy raises issues that are central to how urban regeneration is approached and neighborhood needs and assets are understood. Case studies in this book examine spaces and planning processes that hold the possibility of addressing inequality by forging new economic and social relationships and by embarking on more inclusive and collaborative experiments in culture-based economic development. These examples often focus on building upon the assets of existing residents and broadly define creativity and talent. They also acknowledge both the economic and non-monetary value of cultural practices. This book maintains a critical edge, incorporating left critiques of mainstream creative economy theories and practices into empirical case studies that depart from standard cultural economy discourse. Structural barriers and unequal distributions of power make the search for viable urban development alternatives especially difficult for smaller post-industrial cities and risk derailing even creative grassroots initiatives. While acknowledging these obstacles, this book moves beyond critique and focuses on how the growing economy surrounding culture, the arts, and ecological design can be harnessed and transformed to best benefit such cities and improve the quality of life for its residents.